Selfridges is following their very successful Q on the Roof summer pop-up with a winter rooftop pop-up restaurant on the roof of the store at 400 Oxford Street. It's in the same place, but this time expect more warmng dishes and drinks, including hot chocolate cocktails, and Buttermilk crispy chicken with blue cheese fondue. Plus there will be a log cabin. Booking recommended! 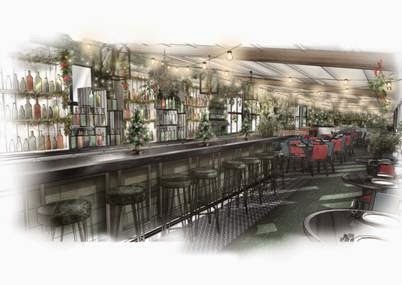 "This October sees the opening of Le Chalet - a winter Alpine-style restaurant on the roof of Selfridges - the second of the store's new 'On The Roof With...' residencies. Le Chalet will be operated by Des McDonald, fresh from the phenomenal success of his 'On the Roof with Q' this summer. This time, McDonald and his team will be transforming Selfridges' rooftop into a destination winter playground. Le Chalet will transport customers high above the streets of London to a wintry retreat poised on top of the world’s best department store. The restaurant will serve a delicious Alpine inspired barbeque menu alongside a crab and shellfish bar. Situated on the terrace will be a log cabin, alongside a hot chocolate cocktail bar to ensure guests escape the wintry chill. Designed by Alexander Waterworth Interiors, the main inspiration for the restaurant is taken from a traditional ski chalet and is combined with accents of wintry ferns, timber branches, and soft low lighting entwined with branches throughout. Tables and relaxed seating are tucked away behind winter ferns to provide an intimate and laidback atmosphere. The menu will be inspired by Le Chalet’s sister restaurant, Q Grill and will include hearty dishes to reflect the season. The kitchen will use quality seasonal produce, locally sourced and simply cooked. Le Chalet's kitchen will be headed up by Chris Dargavel, the Head Chef at On the Roof with Q and will be overseen by Lee Bull, Group Executive Chef. Fergal Dooley, previously at Holborn Dining Room will be the General Manager and the bar will be run by Allan Farrell, former Bar Manager at Sushihno. Starters include; Cornish crab served with pickled celeriac and Colman’s mustard, Peppered tuna with wasabi avocado, and Endive and pear salad with shaved pecorino and hazelnuts. Diners can then choose from Air dried beef with baked raclette, Buttermilk chicken schnitzel with blue cheese fondue, pit grilled ribs and a selection of the finest seafood. The sides provide the perfect accompaniment to the main courses, they include; Roasted roots with honey and thyme and Broccoli with chilli and garlic. The dessert menu has been designed by Siobhan Ambrose, Head Pastry Chef for Des McDonald Restaurants Etc and includes; Eggnog snow egg, Apple streusel with lashings of custard, Black forest cheesecake and Vanilla and blackcurrant rice pudding. Le Chalet’s drinks menu presents an assortment of carefully selected wines, beer, cocktails and soft drinks, along with a generous offering of the finest grand reserve drinks. The list also features a hot chocolate cocktail bar, 'choctails' include; ‘The Cuban’ a delicious concoction of rum, cinnamon and hot chocolate, ‘Double Choc’ a blend of Courvoisier Exclusif, white chocolate and hot chocolate and ‘Malt’ bourbon, malted milk and hot chocolate. These drinks can be enjoyed on the winter chalet porch, accompanied with a Cigar from a specially crafted selection by James J. Fox. Le Chalet also features ‘The Juicery Après-Ski Menu’, by the successful New York health brand The Juicery. Founded by Cindy Palusamy, she has brought together some of the top names in the health and wellness sector to create a unique menu that includes; Superfood hot chocolate, Espresso maca, Superpower espresso shot and Superfood teas." My mother, who lives abroad, came to visit me and spend a shopping day together in London. Having seen previous advertisements, as well as all the branding around the store, we decided to take a break from shopping and venture up to experience this festive pop-up. We arrived and found a couple of seats in the surprisingly small and cramped external area. After being handed drinks menus by a grumpy waiter with extremely poor level of the English language, we were left waiting for at least 15 minutes to place our orders (please note that the venue was not particularly busy, in which case we would have been able to understand the slow speed of service). After the waiter had eventually (and reluctantly) taken our orders (one coffee and one hot chocolate) we resumed conversation and began to wait for our drinks. We waited. And waited. And waited. After a while I realised more than half an hour had passed, and couldn't understand either what was taking so long or why no-one had come over to apologise for the delay. I then tried to get the attention of our surly waiter, who obviously didn't want to acknowledge my attempts to call him over. Eventually he had to speak to me as he was taking orders from the table next to us, and before I even had the chance to say anything, he jumped in armed with excuses at the ready, and flippantly said they were "being make", without apologising or showing any signs of concern over our long wait - for just a couple of simple drinks! We continued to wait. After a while, a waitress came over, to who I explained we had been waiting quite a while for our drinks. Again, we were met with the same, apathetic and careless response, mumbling some irrelevant excuses. She then swiftly moved on to the reason she came over in the first place, which was simply to ask my mother to move to fit in more customers in the already cramped space. Obviously that was the final straw and we decided to leave - frustrated, disappointed and angry. On the lift down we were met by the same man who had showed us up almost an hour before (who was absolutely charming and provided the best possible introduction to "Le Chalet" experience on our way up, by the way). He bubbly asked us if we enjoyed our meals, to which we replied we hadn't even been served our drinks and had suffered abismal customer service. He was so embarrassed at our response and confided that we were actually not the only customers that day who had complained to him on their way down. I work in the creative industry and have a professional understanding of what goes into a project such as this one. The work put in to the marketing, the PR, the branding, the design... was all fantastic! That's what got us in there in the first place, after all! I absolutely applaud all those aspects of Le Chalet. And given the fact I can so deeply comprehend the work gone into this, it it is a massive shame it all fell so short at the end, with the awful customer service. The type of service we experienced may not be completely unexpected from a Nando's; from Selfridges, it definitely is. We were very sorry to read your comments following your recent visit to Le Chalet and would love to follow these up directly with you. Please can you contact our Operations Manager, Paul, at paul@desmcdonald.com so that he can pick this up.